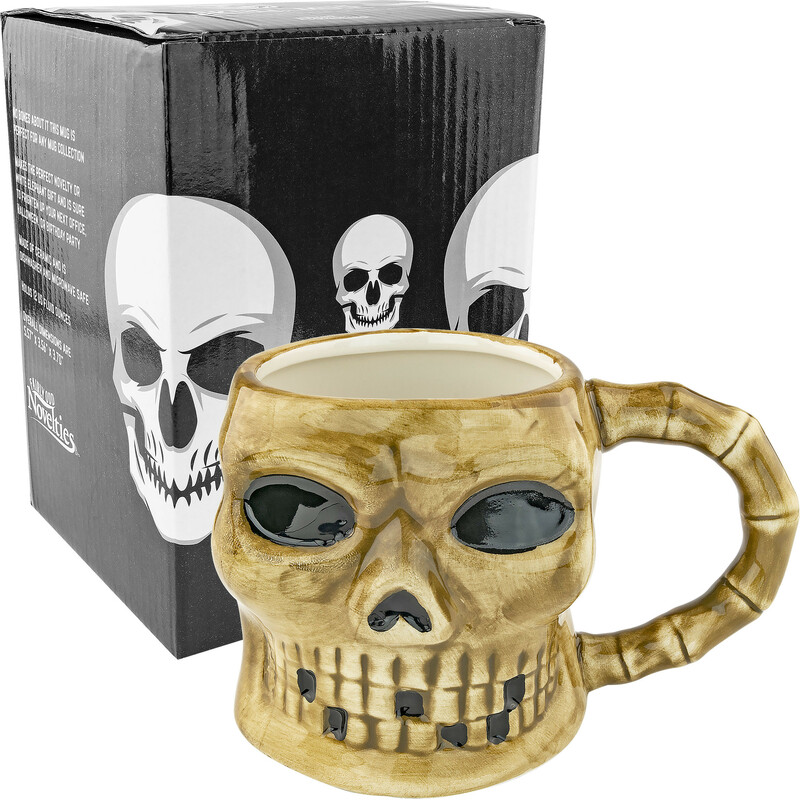 Fairly Odd Novelties is here to scare up some smiles with this Skeleton Skull Mug! This novelty mug features a spooky, smiling skull and a bony handle, making it a bit of must-have plunder for your next pirate-themed party or an eerie essential for Halloween. Make no bones about it, you'll be dying for a drink from this novelty mug! This ceramic mug is dishwasher and microwave safe, and holds 12 US fluid ounces. Overall dimensions are 5.57" x 3.56" x 3.70". Fairly Odd Novelties is here to make sure you never go bone-dry with this Skeleton Skull Mug! Add a bit of darkness to your favorite drinks with this ghoulish, grinning mug! Its large size ensures that you can hold plenty of coffee, tea, cocoa, or pirate punch. This novelty mug features a spooky, smiling skull and a bony handle, making it a bit of must-have plunder for your next pirate-themed party or an eerie essential for Halloween. If you or someone you know likes their coffee as black as their soul, then this mug is sure to make a scary good gift at any birthday, white elephant, or Halloween party. Make no bones about it, you'll be dying for a drink from this novelty ceramic mug! Order today! This ceramic mug is dishwasher and microwave safe, and holds 12 US fluid ounces. Overall dimensions are 5.57" x 3.56" x 3.70".